Welcome to the registration for “quattro de Seca 2019”. 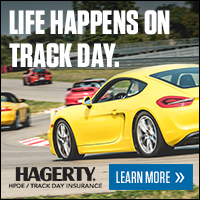 This ONE-day High Performance Driving Event will be held August 22nd at WeatherTech Raceway Laguna Seca covering the 2.238 miles of a challenging track with 11 turns and the famous 5-1/2 story drop between turns 8 & 9 known as the Corkscrew. This event is subject to a 90 dB sound limit. Golden Gate Chapter returns to one of the world’s most iconic of racetracks: WeatherTech Raceway Laguna Seca near Monterey, California. The 2019 quattro de Seca event is for intermediate and advanced drivers. Since there will be no formal, pre-organized instruction all participants must be deemed safe to drive “solo” at Laguna Seca. For solo drivers who have not driven Laguna Seca, demonstration laps with Golden Gate Chapter instructors may be arranged on an informal basis. Please review the detailed requirements as part of the registration process. Contact the registrar if you are unsure if you can register. Laguna Seca provides a special and unique location to learn about your car and yourself and also to raise your driving skills and awareness in an environment that is fun and safe. You will also be able to meet and socialize with a diverse group of Audi Club enthusiasts who drive many different brands of cars, so don’t hesitate to join us if your chosen vehicle is not an Audi. Laguna Seca and the County of Monterey will impose a sound limit of 90 dB for this event. YOU ARE SOLELY RESPONSIBLE FOR INSURING THAT YOUR VEHICLE DOES NOT EXCEED THE SOUND LIMIT. At quattro de Seca 2019 we are focusing on maximizing on-track time for intermediate and advanced drivers. With only three run groups you can expect to benefit from at least five 20+ minute on-track sessions during the day. If you are unsure about your status or wish to obtain pre-approval, please contact the club’s Chief Instructor, Gregg Franklin. Drivers will be aggregated into Run Groups which will be established to allow them to be on track with other drivers of similar experience. Limited demonstration laps or coaching with Golden Gate Chapter instructors may be available (but not guaranteed) for drivers who so wish. Please inform the event master as soon as possible if you would like demo laps or coaching. Please note that you must be a current member of the Audi Club North America. If you are not a current member, please click on the following link and become a member Join ACNA. Please send a copy of your membership email confirmation to the event master so that your member number can be obtained and added to your MotorsportReg.com profile quickly. As a special offer we will refund $30 of the ACNA membership fee for any new members who join and attend this event. The event will take place on Thursday, August 22nd, 2019. Registration will open at 7:00 am and there will be a mandatory All Drivers’ Meeting at 7:45 am. All cars must have passed a technical inspection prior to participant registration and each participant must show documentation of the inspection. ACGG will not be carrying out any Tech inspections at the track for this event. The track will open at approximately 6:30 am on August 22nd. Lunch will be served at the track, but it is not included in the registration price. The track will close at approximately 6pm. There will be no social activities organized for this event. More details will be sent to you as part of the welcome packet, which will arrive by email, approximately one week prior to the event. The registration fee for this event is $450 for all attendees. Garage bays (limited quantity), each of which can hold two cars, are available for rent for $250...hurry to reserve yours! The registration fee includes morning coffee and donuts/pastries as well as water available all day at the track. There are many reasonably priced options for lodging nearby in Seaside and Monterey. We suggest you book early. Please click here for a sample search of availability for the night of April 6th. By clicking continue and registering for this event, you acknowledge that the registration facilitation website, MotorsportReg.com makes no refunds of any kind. View the MotorsportReg.com terms for details. The Audi Club Golden Gate is a chapter of the Audi Club of North America (ACNA), which is a 501c(3) non-profit organization with the purpose of educating its members in driver education, driver safety training, and education about the Audi brand. The Audi Club Golden Gate serves the members in Northern California, and Northern Nevada areas, but our events are open to anyone. To support the educational experience, Audi Club Golden Gate offers a variety of different types of events for our members. In addition to HPDEs, we also offer our members access to new product launches at local dealerships, technical seminars, fun drives, social events, tours, etc. Audi Club Golden Gate enjoys an excellent level of support and participation in our events from our sponsors. We often offer special arrangements with these Audi dealerships, and well recognized private service centers around the geographic proximity to Northern California. Many of our sponsors offer discounts to club members. As a member of ACNA, you automatically become a member of the Audi Club Golden Gate if you live in the two states listed above. You will receive a quarterly magazine from ACNA, as well as periodic emails from us to keep you up to date on all the scheduled events happening throughout the year. Mingle with other Audi owners and club members for new friendships and lasting memories. Go to www.audiclubgoldengate.org for information about the club.